The future world of Alan Moore’s evolved Crossed saga takes another leap forward as Crossed: Wish You Were Here scribe, Simon Spurrier, catapults Future Taylor five more years into the uncertain future. The world has continued to change as the Crossed have developed their own alien culture and grand plan. Towns continue to fall and suspicions about infiltrators are at an all-time high. But when Future finds an infected baby and decides to keep it alive, she begins to see another side to the snapping, snarling, fury that is innate within the Crossed. 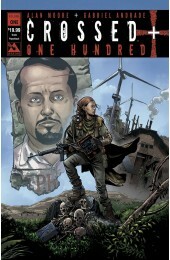 This volume collects issues #13 – 18 of the ongoing Crossed +100 series.